Due to the thermoplastic material the pipes can be welded together which signifies, that the whole pipeline builds a homogenous system and is absolutely safe against infiltrations and exfiltrations. Spicialy against biogenous sulphuric acid corrosion plays a key role regarding the longevity of the system. Even at low temperatures, ensures a robust pipe, resistant against impacts during transport, installation on the site and during the whole service life conditions. Polyethylene and polypropylene can be recycled to 100%. without the structure of the material having to be modified dramatically. Because of the smooth round surface of plastic pipes Polyethylene and polypropylene are not a nutrient medium for bacteria, fungi and spores, so that the material is resistant to all forms of microbial attack as well as to both sulphurous acid and sulfates. Inner diameter and hydraulic properties of KRAH MISR pipes will remain constant regardless of the wall thickness or the profiles due to the smooth anti adhesive inner pipe surface. Compared to other pipe materials like concrete, smaller diameters can be used, which means that costs for material and installation can be reduced considerably. 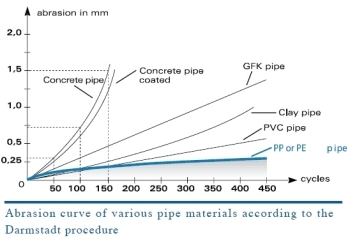 Polyethylene and polypropylene pipes are among the most abrasion proof pipes.This has been tested in the so-called Darmstadt procedure and the results are shown in the below diagram and confirm the quality of polyethylene pipes. 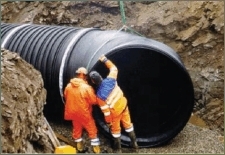 Black polyethylene pipes are permanently resistant to atmospheric corrosion and UV radiation. 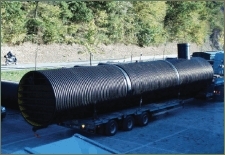 Thus the pipes can be used and stored outside without the pipe material being damaged. No aging effect will occur. Elastic pipes can react to changes in their environment. Due to the deformation performance, the load is distributed to its surrounding and the force acting on the pipe will be diminished. Within a short time there is a balance in the area around the pipeline and the deformation comes to a standstill. profiled pipe can fix the pipes in the soil. There will be no or very few axial extensions in the pipeline. KRAH MISR pipes are nearly unaffected by temperature variations. 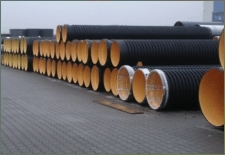 Pipes made of Polyethylene and Polypropylene have considerable advantages to other pipe materials like concrete, steel, ductile etc. Due to their material the KRAH MISR pipes posses over a high elongation at break. This signifies, that the pipe can support even loads or deformations,that were not included in the actual calculation and design of the pipe, like for examples earthquakes. The KRAH MISR Pipes deform conform with the movement of the earth without any breaks or cracks, so that the activity of the pipeline is not drastically affected. 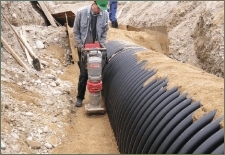 As soon as the overload and earth movement ends, the pipe with go back to its intial condition and position. 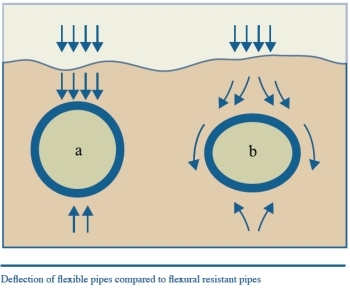 Many years of practical experience have shown that flexible pipes (b) can resist traffic elude a selection strain and other loads more effective than flexural resistant pipes (a) made of concrete or other rigid material.